Today I thought that I’d post the recipe for the stew I made last Sunday. So, as you have probably noticed, I love easy recipes and tend not to measure anything when I cook. This time I really tried to remember my measurements for the stew but I don’t believe I was as successful with the brussels sprouts. I freely admit that anytime I cook meat in our slow cooker I almost always add a can of beer, because honestly, it does make it taste better…right? Combine all ingredients except cornstarch slurry in slow cooker. Cook on high for 4-5 hours or on low for 7-8. Add cornstarch slurry (2 tbsp. cornstarch and enough water to just liquify cornstarch) if you want a thick stew. That’s all there is to it! 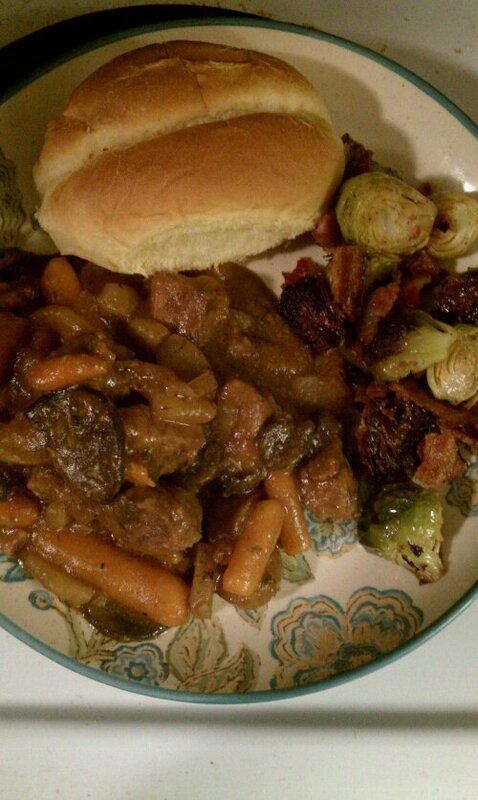 The stew turns out tender and tasty and is so easy I could not imagine making my stew any other way. We also had brussels sprouts. I know that not many people enjoy them but my husband and I do and this recipe infuses them with a bacon-ness that makes them mouthwateringly good. Preheat oven to 350. Trim sprouts and slice in half then place on baking sheet with a lip (I also recommend covering the baking sheet with a layer of foil). Season with salt, pepper and garlic powder. Place cooling rack (for cakes) on top of sprouts then put one layer of bacon on the rack, as many slices as will fit on the rack. Bake for 20-30 minutes or until bacon is crispy. Remove from oven, put sprouts in bowl and crumble (some or all of) the bacon over the top. The sprouts ended up nice and crispy and bacony and entirely delicious. I hope you enjoy these great recipes!